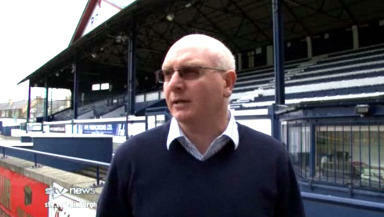 PFA Manager of the Year wants to lead Raith to safety and stay on for another season. Raith Rovers manager John McGlynn hopes he will become a stronger manager for living through the club’s battle against relegation. McGlynn was crowned PFA Scotland Manager of the year less than a year ago, as the Kirkcaldy men were narrowly pipped to the First Division championship by Fife neighbours Dunfermline. This year Raith’s fortunes have plummeted, with just three points separating them from bottom club Queen of the South with three games to play. McGlynn, who lost attacking lynchpin Gregory Tade to Inverness Caledonian Thistle in the summer, believes Raith will come through the trying times. Queens are due to visit Starks Park on April 28 in a crunch match to avoid the drop, and McGlynn hopes the team will stay up grow from the experience. He said: “This is the first time I have been in a relegation battle and I’m hoping it’s going to make me stronger for getting this experience.